Amazon Redshift is a data warehouse that makes it fast, simple and cost-effective to analyze petabytes of data across your data warehouse and data lake. Amazon Redshift can deliver 10x the performance of other data warehouses by using a combination of machine learning, massively parallel processing (MPP), and columnar storage on SSD disks. But even with all that power, it’s possible that you’ll see uneven query performance, or challenges in scaling workloads. Performance optimization for Amazon Redshift is a matter of doing some thoughtful up-front planning and ongoing monitoring as your data volume, users and cluster grow. In this post, we’re describing 14 best practices for performance tuning for Amazon Redshift. If you follow these practices, you’ll have a cluster that is faster, cheaper and easier to scale than any other product on the market. For data teams in charge of managing an Amazon Redshift cluster, using these best practices will help them be successful in building complex data pipelines. We know this from experience. Here at intermix.io, we use Amazon Redshift as part of our core platform. This blog post compiles learnings we’ve made over three years of operating several, very large Redshift clusters at high scale. intermix.io is an analytics platform that provides a single monitoring dashboard for data engineers to keep an eye on their mission-critical data flows. You can have up to 8 queues with a total of up to 50 slots. A query will run in a single slot, by default. Queries can be routed into queues using certain rules. Setting up your WLM the right way will eliminate queue wait times and disk-based queries. We’ve written a detailed guide on tuning WLM that describes the four-steps. The approach will help you eliminate queues wait times and reduce disk-based queries. Both will slow your cluster down, so let’s take a closer look. If you’ve used Redshift for any period of time, you may have come across a situation where a query that used to run for two seconds, all of the sudden starts running much, much slower. The most common reason for this is queueing. The query was waiting in a queue because the # of slots in the cluster was too low for the number of concurrent of queries executing. The default configuration allows you to run five concurrent queries in one queue. That means if five queries are executing, the sixth one will queue until a slot becomes available. The goal is to ensure that queries are not waiting in the queue. This can be done by matching the slot count of the queue with the actual concurrency of the queries running in that queue. Reducing concurrency by distributing queries more evenly throughout the day. Another benefit of using this approach is that you can use Short Query Acceleration for Amazon Redshift (“SQA”) the right way, because there is a downside of SQA. Activating SQA consumes memory within the cluster – which takes us to disk-based queries. Since each queue is assigned a fixed percentage of a cluster’s memory (a value you’ll set when you configure your WLM queue), adding more slots will decrease the memory per slot. Concurrency goes up which causes more queueing. When the frequency of disk-based queries goes up, a chain reaction can occur. More I/O causes more CPU, which in turn make queries run slower, increasing concurrency overall. As a rule of thumb, maintain your queues so that on average fewer than 10% of queries go disk-based. The Amazon Redshift COPY command takes advantage of the parallel architecture and is the recommended way of moving data into Redshift. The COPY command is optimized, but the COPY operation is still expensive. The best practice is to only copy in rows that are needed. Deleting redundant data (deduplication) uses I/O and increases the need to run VACUUM operations. Reduce storage utilization. Because file compression reduces the size footprint of data, you’ll use less of the disk on your cluster nodes. Improve query performance. Because there is less data to scan or join on, I/O usage is limited which increases query speeds. 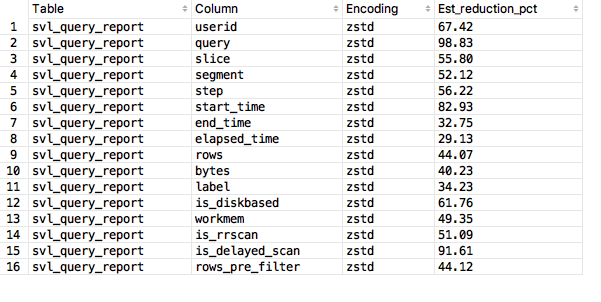 Below is a real-world example of applying ZSTD to three Amazon Redshift logging tables. The average storage reduction is over 50%! When the table already has data in it. For an existing table, encoding cannot change. So even if the COPY command determines that a better encoding style exists, it’s impossible to modify the encoding of the table without doing a deep copy operation. In the below example, a single COPY command generates 18 ‘analyze compression’ commands and a single ‘copy analyze’ command. Extra queries can create performance issues for other queries running on Amazon Redshift. They increase concurrency and hence may saturate the number of slots in a WLM queue, causing other queries to have queue wait times. The solution is to adjust the COPY command parameters to add “COMPUPDATE OFF” and “STATUPDATE OFF”. These parameters will disable these features during “UPSERT”s. Here is an example of a “COPY” command with these options set. It is common to connect an application framework like Django to Amazon Redshift. This is useful when using Redshift data in your application, i.e. in an OLTP scenario. Since Amazon Redshift is an OLAP database, it may not handle these queries well. The challenge of using Redshift as an OLTP database is that queries can lack the low-latency that would exist on a traditional RDBMS and transactional queries. Unlike OLTP databases, OLAP databases do not use an index. This is a result of the column-oriented data storage design of Amazon Redshift which makes the trade-off to perform better for big data analytical workloads. Consider this example from a live production cluster. The user ‘django_redshift’ is querying the table ‘search_word_level_course_vector”, a table with 443,744 rows. The query ran 374,372 times. Each query returned a single row. Each query scans all 443,744 rows, takes about 0.02 seconds to run and returns a single row. The query volume drives up concurrency and may exceed the # of available WLM slots, which results in queue wait times for other queries running in that queue. There two approaches to resolve the problem. Re-write the queries to select all 443,744 rows of the table, and then parse each row in application memory. Doing so would remove 374,371 queries from your Redshift database. Such a single query would take a few seconds, instead of 125 minutes. Use Amazon RDS and DBLINK to use Redshift as an OLTP. It the post “Have your Postgres Cake and Eat it Too” we describe that approach in detail. 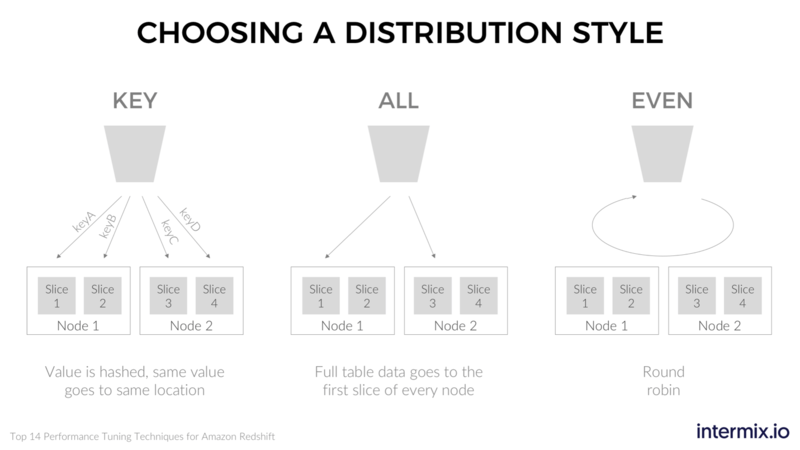 Distribution style is a table property which decides how to distribute rows for a given table across the nodes in your Amazon Redshift cluster. Choosing the correct distribution style is important for query performance. The below diagram shows the three options. Minimize data movement across nodes, which is expensive because of network I/O and disk I/O. Distribute data evenly across your cluster to maximize query performance and minimize row skew. We will cover ‘row skew’ below. Disk utilization of nodes is the same, since there is no row skew. We will explain what ‘row skew’ is below. … and the query execution continues from here. With EVEN distribution, it’s easy to see that step 3 requires the movement of data between nodes. This is not ideal because it requires network (broadcast) traffic and increases I/O utilization across the cluster. Both factors increase query latency. To solve this problem and make JOINs faster, Amazon Redshift offers a KEY-based distribution style. 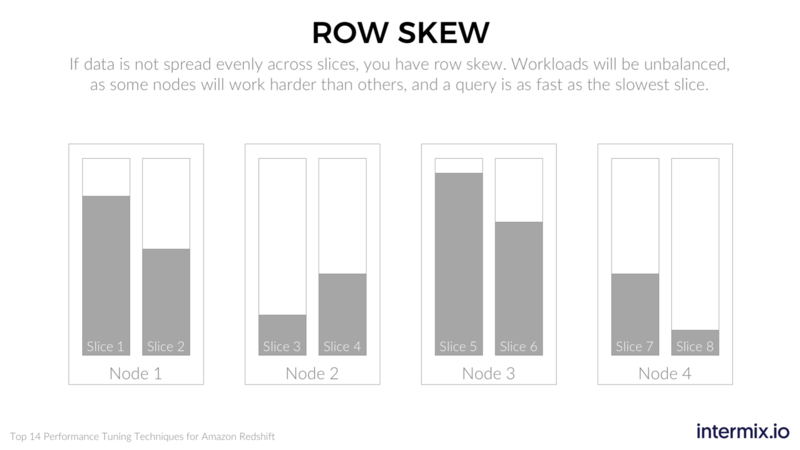 With KEY-based distribution, Amazon Redshift will ensure that for a given column across two tables, step 3 (move data to a single node) will not be necessary. This is accomplished by applying an algorithm when writing data to nodes. The algorithm ensures that rows with the same value in the ‘DISTKEY’ column end up on the same node. Consider an example where the name of the JOIN column is ‘customer_id’. In this case, Query 1 will execute faster than the case when table 1 or table 2 use an EVEN-based distribution. But what happens when I run another type of query against table 1? For example, a query that does not join on “customer_id” but on another column? Or does not do a JOIN at all? Queries which do not JOIN on these columns may run much slower. There are two main downsides of using KEY based distribution. Uneven node disk utilization. Row skew happens when you use KEY based distribution for a table, and the values in the DISTEY column are not evenly distributed. The result is that a node ends up having more rows for that table. Slower queries. With different row counts, all other queries like a straight SELECT that touch that table will be a bit slower. Because one node has more data than the next, the query execution must wait for the “slowest” node” (i.e. the one with the most rows) to send up its data to the leader node. Amazon Redshift builds a custom query execution plan for every query. For a given query plan, an amount of memory is allocated. The memory allocation is determined by estimating the amount of memory needed to store intermediate query results (as in a JOIN or aggregation). The query plan allocates a certain amount of memory to each query, by estimating the amount of memory needed to store intermediate results (e.g. for a JOIN or aggregation). It is important for a query to have sufficient memory to not spill to disk (go “disk-based”). Allocating too much memory is not desirable either however. Queries do not share memory. Allocating more memory than needed wastes memory since it is unavailable to other queries. An important point is that the system is not adaptive. If the plan was wrong and the query needs more (or less) memory than was allocated – the execution engine will not go back and adjust the memory allocation after the query has already started executing. What could cause the plan to be wrong? A major factor is the number of rows in a table. The ANALYZE command will ensure that the planner has an accurate, up-to-date view of the row counts for tables. Let’s look at an example of what happens if the statistics are wrong. In this example, the planner will allocate too little memory to the query. Once the query starts running, it will encounter that it requires more memory than it was allocated. The query will go disk-based and thus will run slower than otherwise. This could have been avoided by running the query in a slot with enough memory. It would not have gone disk-based. The query will not go disk-based, but it used up too much memory. That may cause other queries to go disk-based. The query was allocated more memory than was available in the slot it ran in, and the query goes disk-based. This could have been avoided with up-to-date statistics. Amazon Redshift provides a statistics called “stats off” to help determine when to run the ANALYZE command on a table. The “stats off” metric is the positive % difference between the actual number of rows and the number of rows seen by the planner. As a best practice, we recommend running ANALYZE on any tables with a “stats off” percentage greater than 10%. Amazon Redshift databases require periodic maintenance known as vacuuming. Amazon Redshift is based on PostgreSQL, but unlike PostgreSQL, Redshift doesn’t offer autovacuum. So when a row is deleted from a table in Amazon Redshift, the disk space used by that row is not immediately recovered. A special command is necessary to recover the disk space for use by other tables. In most cases, it’s not desirable to do both things at the same time. The requirements for sorting a table are very different from reclaiming space. Sorting may use a lot of resources and time. the # of rows and data a query processes. the amount of data moving between nodes. Below is an example of a poorly written query, and two optimizations to make it run faster. Queries can run faster by minimizing the amount of data moving between nodes. In practice, this means being careful when writing multi-stage queries where the results of one stage feeds into the next. In the case of our example query, modifying your ‘WHERE’ clauses to only select rows needed will minimize the amount of data that needs to be moved around and speed up the query. Using these two optimizations when writing queries will have dramatic positive effects on your query speeds. High row skew results in uneven node disk utilization (cost) and slower queries (performance). The chart below shows a real-world example. With uneven disk utilization, a single node(s) ends up having more rows for that table. This can be a major (cost) problem if you need to add more nodes in your cluster just because a single node is skewed. With high row skew, doing a straight SELECT on that table will be slower than otherwise. This is because one node has more data than the next, and the query execution must wait for the “slowest” node to send up its data to the leader. The exception to tolerate row skew is if – and only if – you make a conscious decision to optimize a single query. See the section “Use DISTKEYs Only When Necessary” in this article for more information. Short Query Acceleration (SQA) will speed up the execution of short running queries. It does this by selecting certain queries to jump the queue. This can be useful when your cluster runs a mixture of big and small queries. In this case, a small query that would otherwise queue up behind a longer query will execute first. 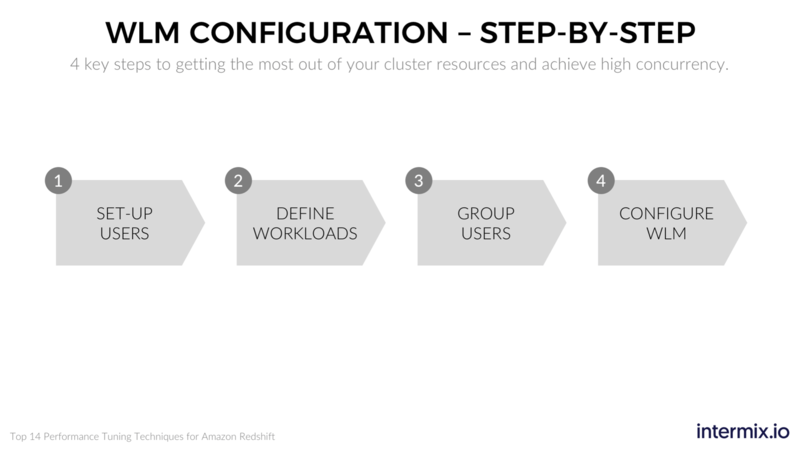 SQA is enabled by default on Amazon Redshift clusters.But using SQA without any other adjustments to your cluster is not a recipe for success. There are other levers to pull first. And then SQA becomes one part of your performance tuning strategy. See our quick guide to using Short Query Acceleration and WLM for Amazon Redshift for faster queries. The Amazon Redshift COPY command is the recommended way of moving data into Amazon Redshift. 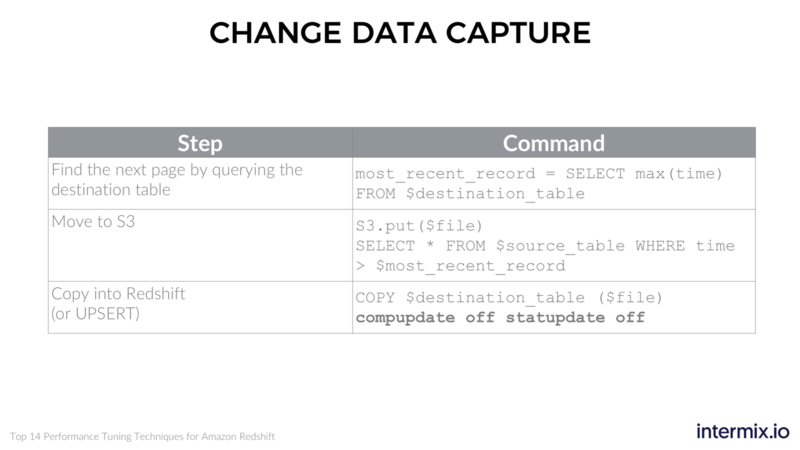 The COPY command takes advantage of the parallel architecture in Amazon Redshift to move data. The COPY command can read files from various sources, including EMR, DynamoDB, and remote hosts via SSH. Faster load process since uncompression un-compression can happen as files are read. Long-running COPY commands will see the most improvement. Amazon Redshift is very good for aggregations on very long tables (e.g. tables with > 5 billion rows). 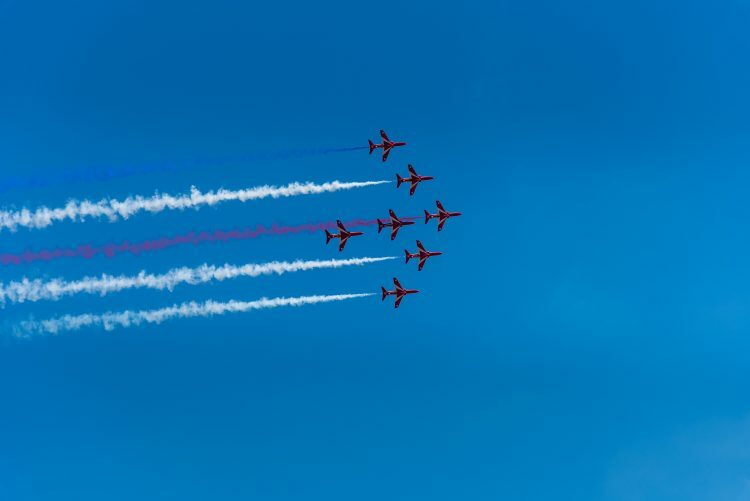 Some use cases call for storing raw data in Amazon Redshift, and then reducing the table and storing the results in subsequent, smaller tables later in the data pipeline. Pruning (i.e. deleting historical data) can be very expensive. This section discusses a few approaches to managing these issues for long tables. Pruning a long table requires running the DELETE operation. This needs to be done rather frequently to avoid the table filling up your disk. On a very long table, these operations can be very expensive. To avoid the three steps you can partition the very long table into smaller tables. Create multiple tables with the same schema, but with different table names. The rows in the table are then partitioned based on the chosen partition key. The job that INSERTs into these tables must be aware of the partitioning scheme. Pruning is simply a matter of dropping the “oldest” table. No need to run VACUUM at all. Drop operations are very inexpensive and reclaim space immediately. There is a downside to this approach. SELECTs on the table will go a bit slower, since the UNION operation won’t be as fast as scanning a single table. But depending on your environment, it’s a small trade-off worth it and a good solution to avoid the pain of maintaining a very long table. We’ve learned that sorting is an expensive operation. If you use an UPSERT method to COPY new data into a table, you will need to sort that table. Since UPSERT performs a DELETE, it may leave the table in an unsorted state. One approach to eliminate the need to sort the table is to COPY in sort order. This will prevent the need for you to ever sort the table. New rows are higher in sort order than existing rows, including rows marked for deletion. Amazon Redshift launched with disruptive pricing. To compare the cost, we’re looking at the price for storing 1TB of data for one year ($ / TB / Year). With a 3-year commitment for the ds2.8xlarge nodes, the price comes down to $934 / TB / Year. That price point is unheard of in the data warehousing world. The average Amazon Redshift customers double their data every year. In fact, that is one of the reasons why it’s important to focus on performance improvements – since managing performance becomes a bigger challenge as data volume grows. At some point, the cost of storing all this data in Amazon Redshift become prohibitive. So kKeeping a multi-year history of data “forever” can become expensive. Deleting data may not be an option, e.g. for regulatory reasons or multi-year comparisons. The issue here is that Amazon Redshift prices based on the size of your cluster, i.e. compute and storage are coupled. You’ll have to keep adding nodes for storage, even though you may not need the additional computing power of the additional vCPUs. Because pricing is so cheap, a common initial behavior is to store all historical raw data in Redshift. But data volume is growing. You may also want to use the faster but more expensive dense compute nodes. Many companies don’t want to make a capital commitment beyond a 1-year term. So keeping a multi-year history of data “forever” can become expensive. Deleting data may not be an option, e.g. for regulatory reasons or multi-year comparisons. The issue here is that Amazon Redshift prices based on the size of your cluster, i.e. it couples compute and storage. You’ll have to keep adding nodes for storage, even though you may not need the additional computing power of the additional vCPUs. Enter Amazon Redshift Spectrum. 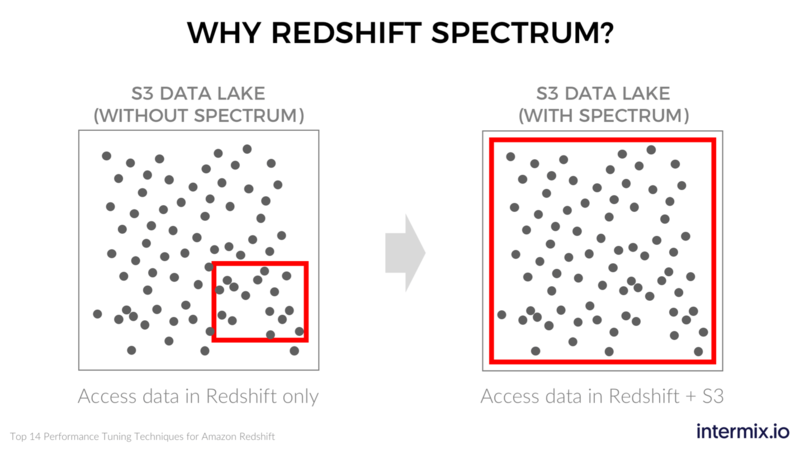 With Redshift Spectrum, you can leave data as-is in your S3 data lake, and query it via Amazon Redshift. You can de-couple compute from storage. This approach makes sense when you have data that doesn’t require frequent access. Leave your “hot” data in Amazon Redshift, and your “cold” data in S3. The impact on cost can be substantial. The price for S3 Standard Storage is $281 / TB / Year. And so with Redshift Spectrum, you get the best of both worlds. We call it “data tiering”. You get to keep all your historical data, along with the performance of Amazon Redshift. 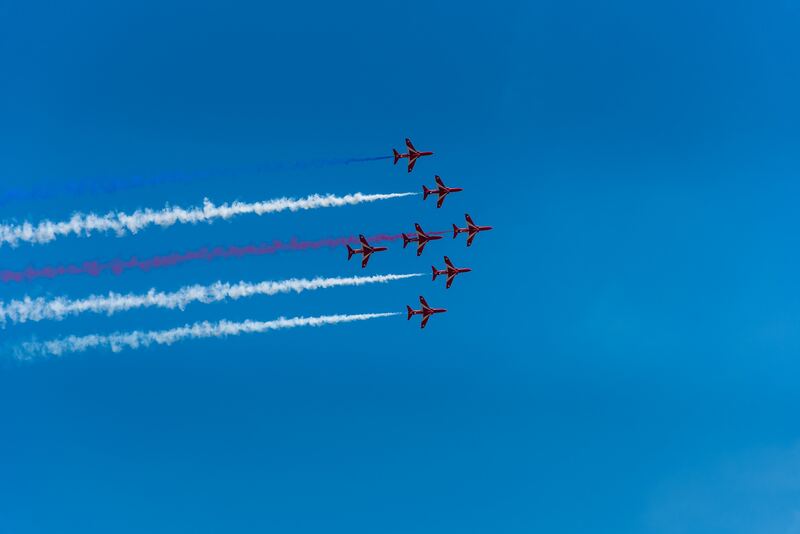 With Redshift Spectrum you can benefit from the cost savings of using S3. 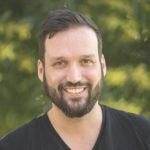 In “Amazon Redshift Spectrum: Diving into the Data Lake!”, we’re taking an even closer look at using Redshift as part of a data lake architecture, including the use of Amazon Athena and AWS Glue. Amazon Redshift is a cloud-based data warehouse that offers high performance at lower cost. But uneven query performance or challenges in scaling workloads are possible. 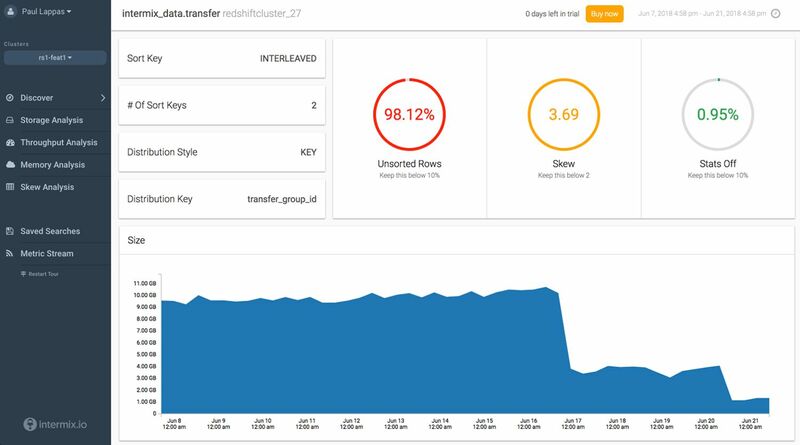 With the performance tuning techniques we describe in this blog post, you’ll get the best performance results possible, lower the cost of operating your cluster, and achieve higher productivity for your data team. If you’d like a pdf version of this post, click here and we’ll send you a link for download.